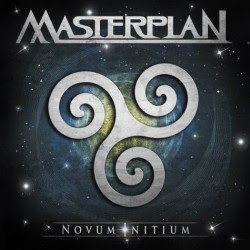 Masterplan are a German Power Metal band founded in 2002 by former Helloween bandmates Roland Grapow and Uli Kusch. Over the years, Masterplan found moderate success with several albums featuring lead singer Jorn Lande. Roland Grapow has returned after 3 years with a brand new army of musicians, this truly is a "Novum Initium" (A New Beginning). Helloween were the band that brought me into the world of power metal. After finally exhausting my collection of their entire discography, I knew I needed something new. This is when I started delving into the side projects. After enrapturing my ears with Kai Hansens Gamma Ray I moved along to Roland Grapows Masterplan. I have to admit, I wasn't sold at all back in 05 when I first heard them. Now, in 2013, Masterplan has captured my full attention. With album number 5, Masterplan has parted ways with erratic frontman Jorn Lande and brought in former 'At Vance' singer, Rick Altzi. Joining Rick, Roland, and long time keyboardist Axel Mackenrott on the new lineup is former Stratovarius Bassist Jari Kainulainen and Cradle Of Filth Drummer Martin Skaroupka. The power metal influences are still prominent throughout the entire album, but adding a more slick, catchy and melodic sound. Roland Grapows attitude towards his guitar playing is evidently "Quality over Quantity". The guitar riffs and solos ricochet perfectly through each and every song, but Roland knows exactly when to hold back and let the other band members shine through. This withdrawal allows us to fully hear the thunderous blasts from drummer Martin Skaroupka, and of course the powerful and gruff set of pipes on singer Rick Altzi. The album kicks off to a great start, showcasing some of masterplans best songs. The first stand out track, is of course, the lead single Keep Your Dreams Alive This is where the new singers voice truly breaks through as he gets to show off his great breadth of range. It is shortly followed by hook-laden Black Night Of Magic. With Axel Mackenrotts driving keyboard riff I expect this, instantly infectious track, being replayed in years to come. I must say, after the 5th track Betrayal, the songs start to dart along the lines of repetitiveness and sadly become a bit dreary. Things pick up, ironically, with the ballad Through Your Eyes where Rick Altzi belts his heart out, showing us all that is in him to sing . The album comes to a perfect close with the title-track, Which although surpasses the 11 minute mark, it never fails to keep the listener interested throughout. It's also were every member of the band comes together and adds their own piece to the puzzle. The song writing has improved a great deal over the years, musically, this easily ranks as one of masterplans greatest. This truly is a 'Novum Initium' and a downright amazing one at that.